Kawarau River, Queenstown, New Zealand. Queenstown is a resort town in Otago in the south-west of New Zealand's South Island. It is built around an inlet called Queenstown Bay on Lake Wakatipu, a long thin Z-shaped lake formed by glacial processes, and has spectacular views of nearby mountains such as The Remarkables, Cecil Peak, Walter Peak and just above the town; Ben Lomond and Queenstown Hill. 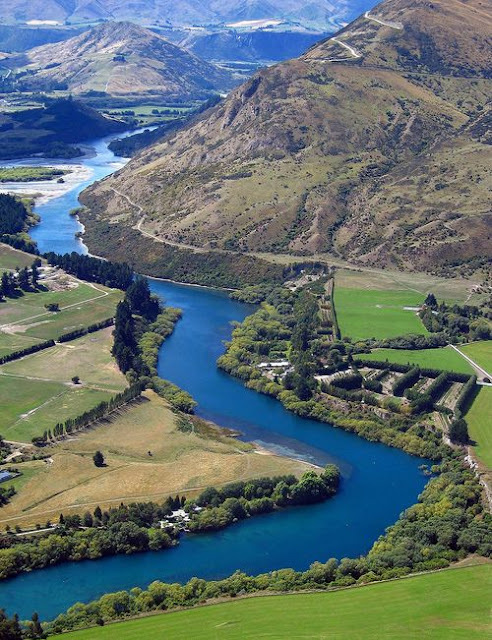 The Queenstown-Lakes District has a land area of 8,704.97 km² not counting its inland lakes.